Search engine Google, owner of one of the most powerful brands on the internet, is now close to floating its shares for the first time, according to a swathe of media reports. The firm has contacted more than a dozen investment banks to help arrange a share sale, and has already drawn up a shortlist, the Wall Street Journal reported. According to Reuters, a flotation of the privately-owned firm is pencilled in for early next year, a deal that could value Google at up to $25bn (£14.7bn) - slightly more than listed online retailer Amazon. The Financial Times, meanwhile, reported that Google planned to sell shares by means of an online auction - an unusual method which would aim to avoid the sort of brokerage scandals seen in some share flotations in the 1990s. Google's intention to sell shares has never been in doubt: such a move would raise capital, and enable the firm to motivate staff with perks such as stock options. In addition, analysts say the time is ripe for a hi-tech flotation, as investors are starting to return to the long-shunned market. An initial public offering on the sort of scale Google is reportedly contemplating would be by far the biggest share launch since hi-tech markets turned sour three years ago. The sheer size of the deal makes it likely that Google will choose an investment bank-led transaction, rather than selling shares directly to the public online. 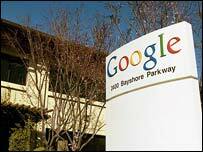 Friday's reports cited unnamed sources within Google; the company itself has refused to comment. Google has built up a formidable reputation in the crowded search-engine market, mainly thanks to its uncannily accurate relevance-based search techniques. At the same time, it has shunned the sort of corporate trappings - notably advertising - that have transformed rivals such as Yahoo. Google does not publish financial statements, but is believed to be highly profitable, earning money mainly by sponsored searches and by licensing its search technology. Estimates of its annual revenue range from $500m to $1bn, with profits at least at $100m.